WHY: You’ve worn out that winter coat and are fiending for a style alternative. 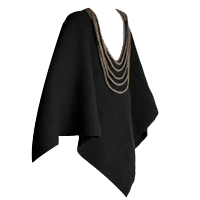 Cue the poncho; the underappreciated alternative on the warmth front. This isn’t your average toss-over layering piece! It’s named for Alerce, a native tree in Araucanía, Chile, and was designed by artisans Irma Lincoqueo and Rosa Ñanculef in one of VOZ’s collaborative workshops. The weaving, knitting, and dyeing process was hand-hewn and care-filled; style it with just as much attention! Whether you belt it or let it billow, give that winter coat a weekend break.